Conrad Herwig&apos;s Latin Side All-Star Band, by Mike Rainey At first, like a stew that&apos;s just beginning to simmer, the various elements of the band were bright and beautiful but didn&apos;t quite meld together into a delicious whole. But just like that stew, the audience&apos;s patience was rewarded as the elements eventually combined to produce a top-notch performance. 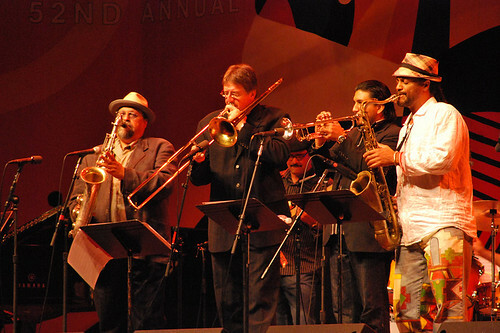 Conrad Herwig&apos;s Latin Side All-Star Band, by Mike Rainey Catch Conrad Herwig&apos;s Latin Side All-Star Band Saturday night at the Monterey Jazz Festival on the Bill Berry Stage at 10:30pm. For all our coverage of the Monterey Jazz Festival, see our Monterey Jazz Festival category.